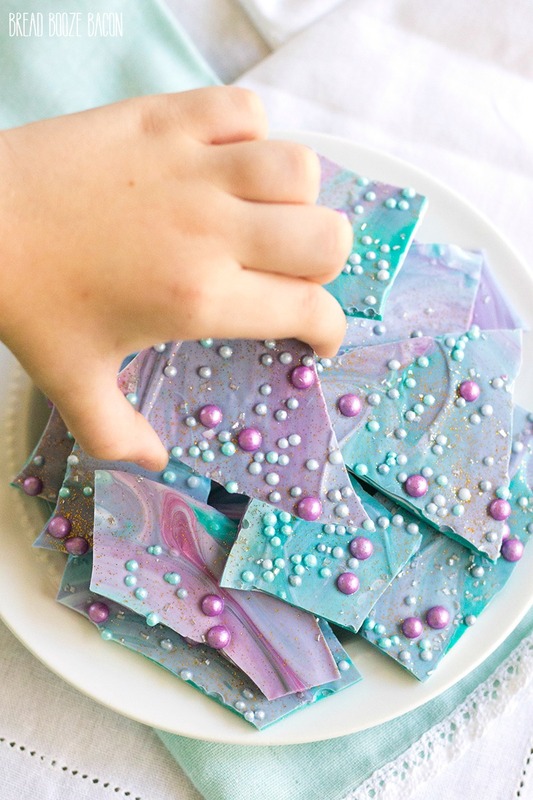 This fun and colorful Mermaid Bark recipe is perfect for birthday parties and pool parties alike. It’s an easy treat that will brighten any day! Do you ever just see something and have to make it yours? That’s totally what happened to me this week. My amazing girlfriends Kat & Mel from Home.Made.Interest came up with this killer Mermaid Ice Cream. I saw it, fell in love, oooh’d and ahhh’d. 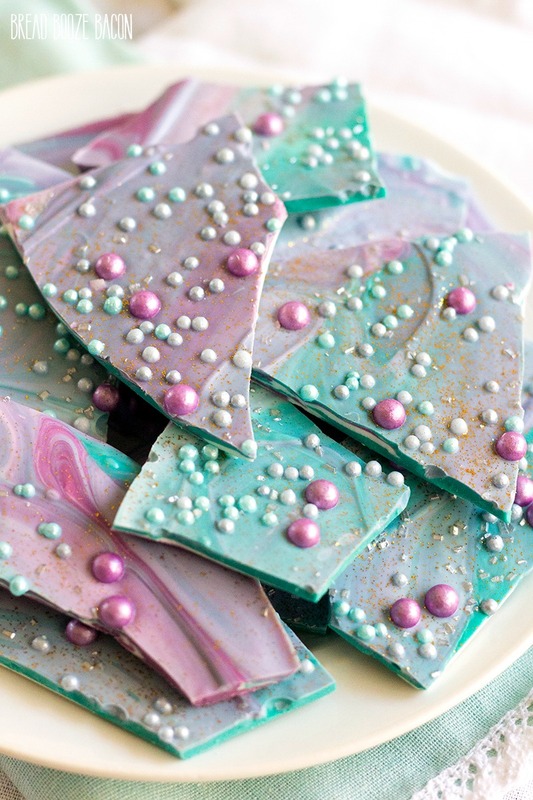 Then I immediately said, “I’m making mermaid bark!” Because duh! 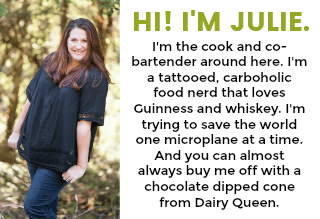 Kind of funny that their ice cream inspired today’s post because my unicorn ice cream inspired their ice cream recipe. We just get each other. You remember those Bourbon Bacon Roast Beef Sliders the girls shared with all of you, right?! Totally proof that we should all just live next door to each other and make food all day long. So this bark is super cute and I can’t stop staring at it. I gave some away to all the little girls at my son’s friend’s birthday party and they all freaked out over it. #momwin While the top of the bark is all swirly and cool looking, underneath it looks like a chunky Jackson Pollock painting, and when the bark breaks apart you can see all the layers inside. For the decorations I used these Chocomaker chocolate shimmer beads I found on sale at Michael’s. They worked perfectly! I grabbed a couple different sizes in coordinating colors and BAM! Mermaid heaven! Shimmer Sixlets would totally work for this recipe, even though they’re all the same size. Just add some other fun sprinkles in to mix things up! 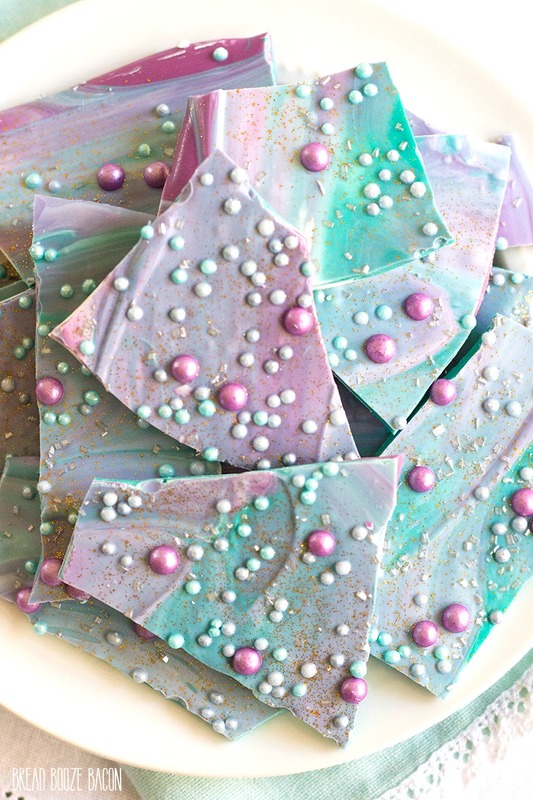 This fun and colorful Mermaid Bark recipe is perfect for birthday parties and pool parties alike. It's an easy treat that will brighten any day! Pour each color of candy melts into their own microwave safe bowl. Line a baking sheet with a silicone mat or waxed paper. Make dollops of each of the candy melt colors all over the prepared baking sheet. Use an offset spatula to swirl the colors together and spread the candy to the edges of the baking sheet. The less you can mix the colors the better. You want the colors swirled, not completely mixed together. 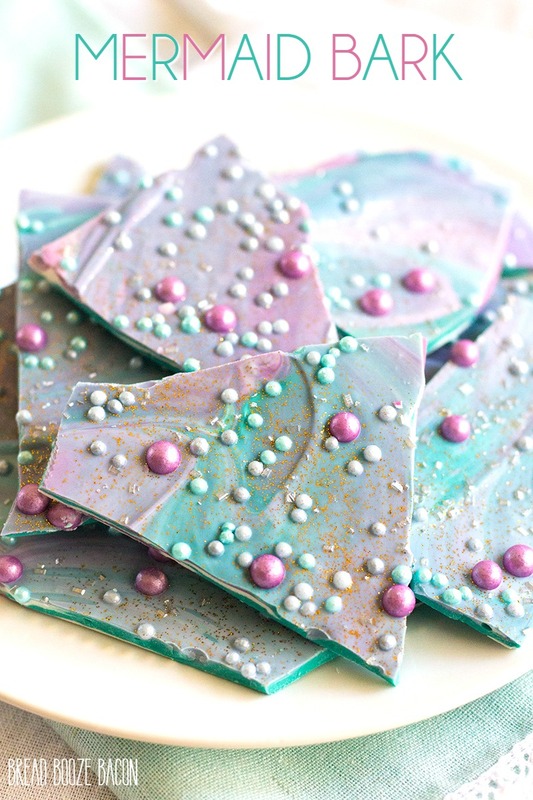 Sprinkle the top of the bark with chocolate shimmer beads, silver sprinkles, and gold disco dust. Refrigerate the candy for 15 minutes, or until set. Peel the candy off the silicone mat (or waxed paper) and use your hand to break into pieces. Disco dust is optional. I liked the glitter effect it gives. If you prefer to not use disco dust, any gold sprinkle would work just fine too. This is SO pretty- my daughter would seriously love it! I especially love the flecks of gold! 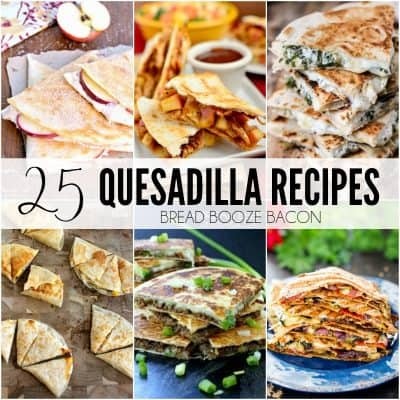 Hi, how far in advance can you make this? Will it last a few days in the fridge? Can you shar a link to the kind of gold disco dust you use? Thanks!